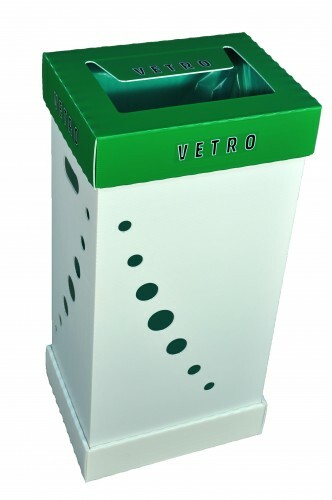 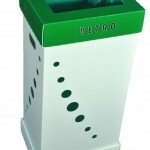 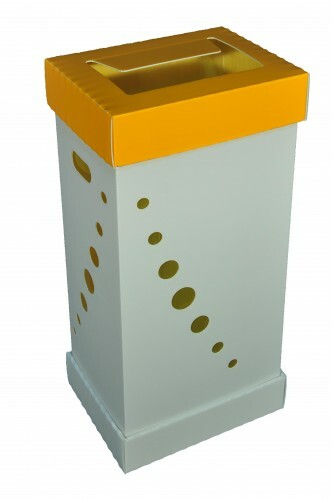 ECO LIGHT 100 is a tough and durable container, for the collection of waste such as plastic, paper, metal, glass, organic, undifferentiated and is ideal for placement in offices, hospitals, schools, fairs and in all kindsof events. 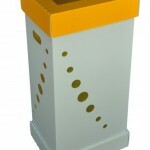 ECO LIGHT 100 is made of polypropylene (PP) with alveolar thickness of 3 mm. 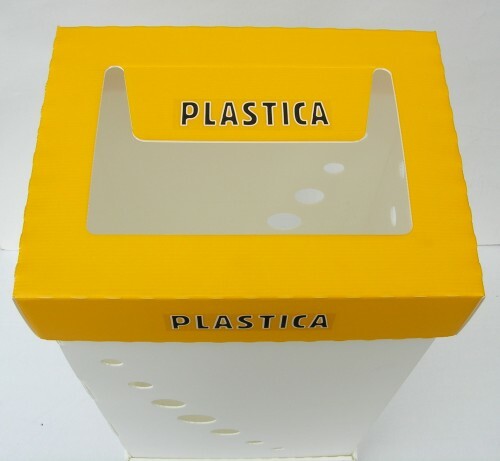 in light material, washable, easy to handle, reusable and long lasting, and excellent mechanical properties against impact and chemical characteristics of resistance to water, acids, solvents, and each type of agent deteriorating. 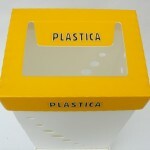 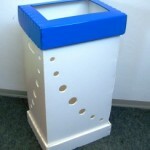 The stem in white color, is equipped with two slits for use with handles and holes of ventilation, function which make the container particularly suitable for the differentiated collection of the organic fraction carried out with plastic bags biodegradable and compostable certified EN 13432. 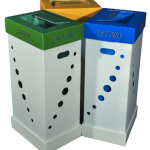 The ventilation in fact, allows for easier evaporation of the water contained in the wet organic waste, with a consequent reduction of weight and elimination of bad odors. 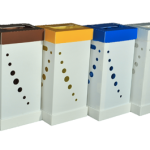 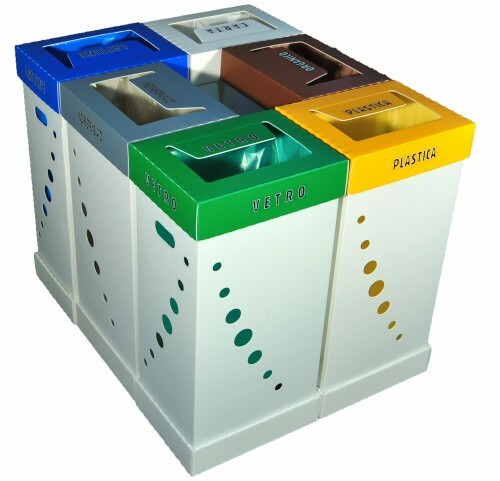 The cover is available in blue, white, yellow, gray, green, and brown for quick identification of the waste to be delivered, together with practical stickers with the name of the waste, easily removable for the insertion of the bag and for the internal cleaning of the container. 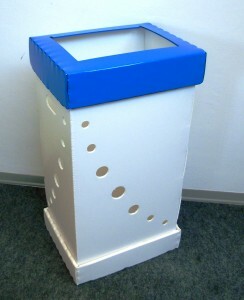 The white color base is unlockable as the cover, thus allowing an easy extraction of the bag in the case of particularly heavy or bulky waste. 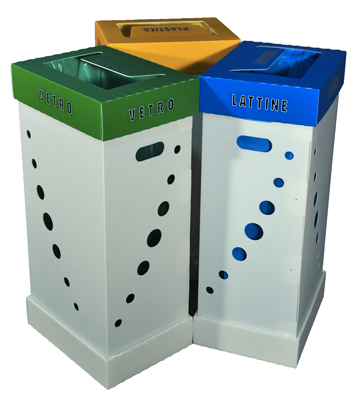 ECO LIGHT 100 is completely folded in three parts: base, shaft and lid for easy and compact storage of the containers in awaiting use.